The Indiana Jones franchise is an entertainment franchise, based on the historical adventures of Dr. Henry "Indiana" Jones, a fictional archaeologist. It began in 1981 with the film Raiders of the Lost Ark. A prequel, Indiana Jones and the Temple of Doom, followed in 1984 and the sequel Indiana Jones and the Last Crusade in 1989. In 1992, The Young Indiana Jones Chronicles began airing on television. A fourth film, Indiana Jones and the Kingdom of the Crystal Skull, was released in 2008. The series was created by George Lucas; the films star Harrison Ford and were directed by Steven Spielberg. In addition, Marvel Comics began publishing The Further Adventures of Indiana Jones in 1983, and Dark Horse Comics earned the comic book rights to the character in 1991. Novelizations of the films have been published, in addition to a series of German novels by Wolfgang Hohlbein, and twelve novels set before the films published by Bantam Books. Numerous video games about Indiana Jones have been released since 1982. Indiana Jones and the Raiders of the Lost Ark (1981) is set in 1936. Indiana Jones (Harrison Ford) is assigned by government agents to locate the Ark of the Covenant before the Nazis do, to make them invincible like the Israelites in the Old Testament, who revered it as the dwelling place of God. The Nazis are being helped by Indiana's nemesis René Belloq (Paul Freeman). With the help of his old flame Marion Ravenwood (Karen Allen) and Sallah (John Rhys-Davies), Indiana manages to recover the Ark in Egypt. The Nazis manage to steal the Ark and capture Indiana and Marion. Belloq and the Nazis perform a ceremony to open the Ark, but when they do so, they are all killed gruesomely by the Ark's wrath. Indiana and Marion, who survived by closing their eyes, manage to get the Ark back to America, where it is stored in a secretive government warehouse. 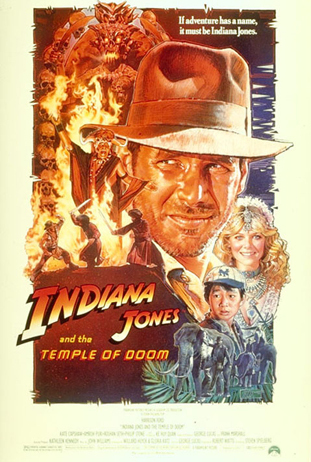 Indiana Jones and the Temple of Doom (1984) is set in 1935, a year before Raiders of the Lost Ark. Indiana escapes Chinese gangsters with the help of singer/actress Willie Scott (Kate Capshaw) and his twelve-year-old sidekick Short Round (Jonathan Ke Quan). The trio crash-land in India where they come across a village whose children have been kidnapped. A destructive cult led by Mola Ram (Amrish Puri) have also taken the holy Sankara Stones, which they will use to take over the world. Indiana manages to overcome Mola Ram's evil power, and rescues the children and returns the stones to their rightful place, overcoming his own mercenary nature. Indiana Jones and the Last Crusade (1989) opens in 1912 where a thirteen-year-old Indiana (River Phoenix) attempts to recover an ornamental cross belonging to Francisco Vásquez de Coronado, a task which he finally completes in 1938. Indiana along with his friend Marcus Brody (Denholm Elliott) are assigned by American businessman Walter Donovan (Julian Glover) to find the Holy Grail. They are teamed up with Dr. Elsa Schneider (Alison Doody), following on from where Indiana's estranged father Henry (Sean Connery) left off before he disappeared. It turns out Donovan and Elsa are in league with the Nazis, who captured Henry in order to get Indiana to help them find the Grail. However, Indiana recovers his father's diary filled with his research, and manages to rescue him before finding the location of the Grail. Both Donovan and Elsa fall to the temptation of the Grail, while Indiana and Henry realize that their relationship with each other is more important than finding the relic. 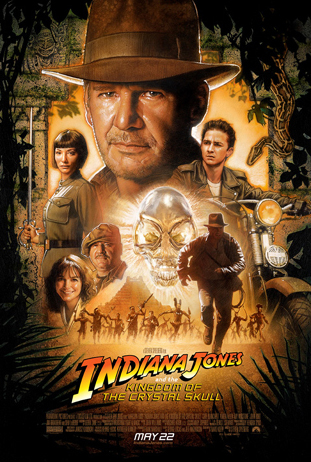 Indiana Jones and the Kingdom of the Crystal Skull (2008) is set in 1957, making it nineteen years since The Last Crusade, and thus acknowledging the real-life passing of years between films. Indiana is having a quiet life teaching before being thrust back into his old adventuring. He races against agents of the Soviet Union, led by Irina Spalko (Cate Blanchett) for the crystal skull. Indy's journey takes him across Nevada, Connecticut, Peru, and the forest of the Amazon in Brazil. In the film. Indiana is faced with betrayal by one of his best friends, Mac (Ray Winstone), is introduced to a greaser named Mutt Williams (Shia LaBeouf), who turns out to be his son (real name revealed to be Henry Jones III), and is reunited with his old flame Marion Ravenwood. In 1973, George Lucas wrote The Adventures of Indiana Smith. Like Star Wars, it was an opportunity to create a modern version of the serials of the 1930s and 1940s. Lucas discussed the concept with Philip Kaufman, who worked with him for several weeks and came up with the Ark of the Covenant as the plot device. The project was stalled when Clint Eastwood hired Kaufman to write The Outlaw Josey Wales. 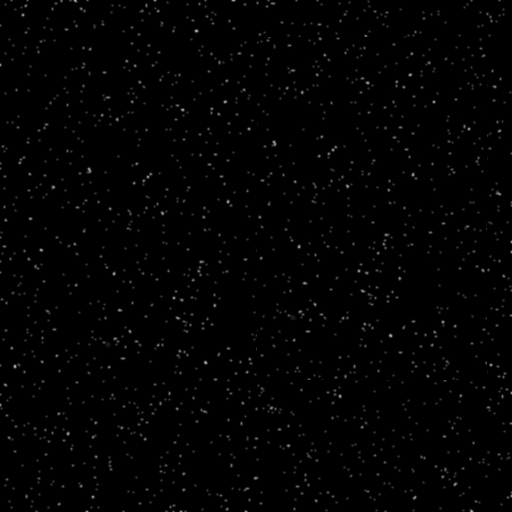 In May 1977, Lucas was in Maui, trying to escape the enormous success of Star Wars. Friend and colleague Steven Spielberg was also there, holidaying from work on Close Encounters of the Third Kind. Spielberg told Lucas he was interested in making a James Bond film. Lucas then told him of an idea "better than James Bond", explaining the plot of Raiders of the Lost Ark. Spielberg loved it, calling it "a James Bond film without the hardware", though he had the character's surname changed to "Jones". Spielberg and Lucas made a deal with Paramount Pictures for five films about Indiana. Spielberg and Lucas aimed to make Indiana Jones and the Temple of Doom much darker, because of their personal moods following their respective break-ups and divorces. Lucas made the film a prequel as he didn't want the Nazis to be the villains again. He had ideas regarding the Monkey King and a haunted castle, but wound up creating the Sankara Stones. He hired Willard Huyck and Gloria Katz to write the script as he knew of their interest in Indian culture. 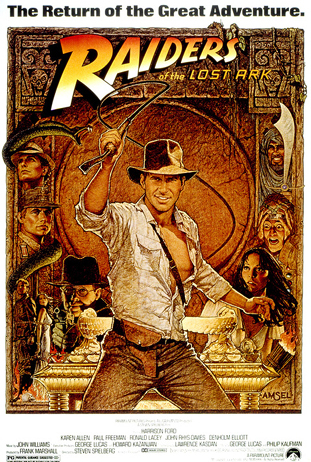 The major scenes that were dropped from Raiders of the Lost Ark were included in this film: an escape using a giant rolling gong as a shield, a fall out of a plane in a raft, and a mine cart chase. For the third film, Spielberg revisited the Monkey King and haunted castle concepts, before Lucas suggested the Holy Grail. Spielberg had previously rejected it as too ethereal, but then came up with telling a father-son story. He thought, "The Grail that everybody seeks could be a metaphor for a son seeking reconciliation with a father and a father seeking reconciliation with a son." 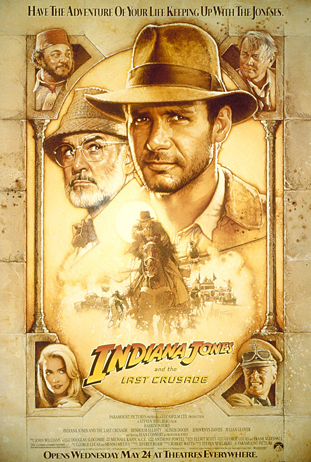 Following the 1989 release of Indiana Jones and the Last Crusade, Lucas let the series end as he felt he could not think of a good plot device to drive the next installment, and chose instead to produce The Young Indiana Jones Chronicles, which explored the character in his early years. Ford played Indiana in one episode, narrating his adventures in 1920 Chicago. When Lucas shot Ford's role in December 1992, he realized the scene opened up the possibility of a film with an older Indiana set in the 1950s. The film could reflect a science fiction 1950s B-movie, with aliens as the plot device. Ford disliked the new angle, telling Lucas "No way am I being in a Steve Spielberg movie like that." Spielberg himself, who depicted aliens in Close Encounters of the Third Kind and E.T. the Extra-Terrestrial, resisted it. Lucas came up with a story, which Jeb Stuart turned into a script from October 1993 to May 1994. Lucas wanted Indiana to get married, which would allow Henry Jones Sr. to return, expressing concern over whether his son is happy with what he has accomplished. After he learned that Joseph Stalin was interested in psychic warfare, he decided to have Russians as the villains and the aliens to have psychic powers. Following Stuart's next draft, Lucas hired Last Crusade writer Jeffrey Boam to write the next three versions, the last of which was completed in March 1996. Three months later, Independence Day was released, and Spielberg told Lucas he would not make another alien invasion film. Lucas decided to focus on the Star Wars prequels. In 2000, Spielberg's son asked when the next Indiana Jones film would be released, which made him interested in reviving the project. The same year, Ford, Lucas, Spielberg, Frank Marshall, and Kathleen Kennedy met during the American Film Institute's tribute to Ford, and decided they wanted to enjoy the experience of making an Indiana Jones film again. Spielberg also found returning to the series a respite from his many dark films during this period. Spielberg and Lucas discussed the central idea of a B-movie involving aliens, and Lucas suggested using the crystal skulls to ground the idea. Lucas found those artifacts as fascinating as the Ark, and had intended to feature them for a Young Indiana Jones episode before the show's cancellation. M. Night Shyamalan was hired to write for an intended 2002 shoot, but he was overwhelmed writing a sequel to a film he loved like Raiders, and claimed it was difficult to get Ford, Spielberg, and Lucas to focus. Stephen Gaghan and Tom Stoppard were also approached. Frank Darabont, who wrote various Young Indiana Jones episodes, was hired to write in May 2002. His script, entitled Indiana Jones and the City of Gods, was set in the 1950s, with ex-Nazis pursuing Jones. Spielberg conceived the idea because of real life figures such as Juan Perón in Argentina, who protected Nazi war criminals. Darabont claimed Spielberg loved the script, but Lucas had issues with it, and decided to take over writing himself. Lucas and Spielberg acknowledged the 1950s setting could not ignore the Cold War, and the Russians were more plausible villains. Spielberg decided he could not satirize the Nazis after directing Schindler's List, while Ford felt "We plum[b] wore the Nazis out." Darabont's main contribution was reintroducing Marion Ravenwood as Indiana's love interest, but gave them a 13-year old daughter, which Spielberg decided was too similar to The Lost World: Jurassic Park. Jeff Nathanson met with Spielberg and Lucas in August 2004, and turned in the next drafts in October and November 2005, titled The Atomic Ants. David Koepp continued on from there, giving his script the subtitle Destroyer of Worlds, based on the Robert Oppenheimer quote. It was changed to Kingdom of the Crystal Skull, as Spielberg found it more inviting a title and actually named the plot device. Koepp wanted to make Mutt into a nerd, but Lucas refused, explaining he had to resemble Marlon Brando in The Wild One; "he needs to be what IndianaJones' father thought of [him] – the curse returns in the form of his own son – he's everything a father can't stand". Koepp collaborated with Lawrence Kasdan on the film's "love dialogue". Spielberg responded it would happen "only if you [the audience] want more". can get his own hat. I earned that hat." be a factor, as Ford was "65 and did everything in this movie [Crystal Skull]. continuing the series with a spin-off, joking "Indiana Jones is Indiana Jones. the fifth film "crazy but great". those are the only witness to what he's seen. That's kind of interesting." series is full of opportunity." Triangle, although these rumors were later clarified as "completely false"
that there’s a story that they like," said Allen, "which is a huge step forward. Indiana Jones and the Kingdom of the Crystal Skull in 2008.
civilizations and languages, and fear of snakes. Belloq, and Arnold Toht, a sinister Gestapo agent. return of the infamous Nazi mystics, this time trying to find the Holy Grail. buddy movie of sorts, teaming Jones with his father, often to comical effect. operations with MI6 agent George McHale on the Soviet Union. prologue of Indiana Jones and the Last Crusade, after being given his hat. wise enough to close his eyes in the presence of God in the Ark of the Covenant. to communicate directly with God. sidekicks Mutt and Mac are youthfully arrogant and greedy, respectively.